Arsenal were soundly beaten 3-1 in a lop-sided encounter at the Etihad Stadium. The Gunners got off to the worst possible start as they found themselves behind within the first minute. After clearing the initial danger, a moment of indecision by Iwobi allowed Laporte to whip in a delicious cross for Aguero to prod home. Arsenal though fought back courtesy their captain, Koscielny. A clever near-post flick left the Frenchman with the easy task of nodding home from inside the six-yard box. The visitors seemed to have settled in after the leveller yet they were undone minutes before half-time by a sublime team goal. Gundogan’s delicate chip released Sterling who squared the ball for Aguero to score his second. In the second half, Manchester Citycompletely dominated Arsenal and put the game to bed in the 61st minute courtesy their talismanic striker, Aguero. The defeat, coupled with Chelsea and Manchester United’s successes, meant that the Gunners slipped out of the top five for the first time in quite a while. Unai Emery sprung a surprise yet again (maybe not that surprising anymore). The Spaniard decided to play Kolasinac and Monreal together with the former functioning as a left-sided midfielder. On the other flank, Emery opted for Iwobi with the Nigerian’s better defensive work rate tilting the odds in his favour. The thinking behind such a decision was clear: Emery wanted Arsenal to nullify City’s threat on the flanks and not get outnumbered. Yet, all of City’s goals came from crosses down the left wing with Sterling bagging a couple of assists and Laporte too chipping in. Time and again, Kolasinac let players run in behind him and Iwobi didn’t fare any better. Moreover, the latter could be held culpable for the first and third goals City scored. In addition, Arsenal couldn’t create anything worthwhile in the wide areas and were pinned back by their opposite numbers for the majority of the game. Travelling to City represents one of the most daunting tasks on the Premier League calendar. Though Emery developed a decent enough blueprint to outsmart the Cityzens, his players just couldn’t pull it off. The only positive for Arsenal though would be that they don’t have to face City anymore this season. Arsenal decided to play a conventional 4-4-2 with Guendouzi and Torreira as the central midfield duo. On paper, the system looked fine with the additional numbers in the middle of the park considerably reducing the threat of City’s midfield. Yet, the Gunners ultimately suffered as Guardiola’s usage of Fernandinho worked a charm. Whenever City had the ball, the Brazilian stepped into midfield and made it a 3v2 in their favour. With an increased man in the centre of the pitch, the hosts pulled Arsenal apart piece by piece. The Gunners never got close to the trio ofDavid Silva, De Bruyne and Fernandinho and eventually paid the price. Though the pairing of Torreira and Guendouzi displayed plenty of determination and courage, they were just out-played, out-passed and out-numbered in midfield. There have been days previously when Arsenal’s midfield has just failed to turn up in a big away game. Yet, today, it was more a case of the opposition being extremely superior. Gooners got their wish on Sunday as Emery fielded Arsenal’s deadly duo of Aubameyang and Lacazette. However, the Arsenal faithful’s joy was limited to the selection only as the pair turned in abject performances. Though the Frenchman hustled and tried to make things happen, nothing came off for him. As for the Gabonese, he was anonymous for the entirety of the game. While Aubameyang has popped up with 15 league goals so far, his complete lack of contribution to the Gunners’ attacking play might just be causing a furrowed brow or two. Moreover, Emery’s selection of Iwobi and Kolasinac didn’t pay off as both were guilty of passing up good opportunities. To compound matters, the aforementioned players also contrived to impact Arsenal in a negative way defensively. The most worrying aspect though was that the Gunners’ only substantial threat arrived from set-pieces. In totality, they mustered four shots at Ederson’s goal of which only a couple were on target. 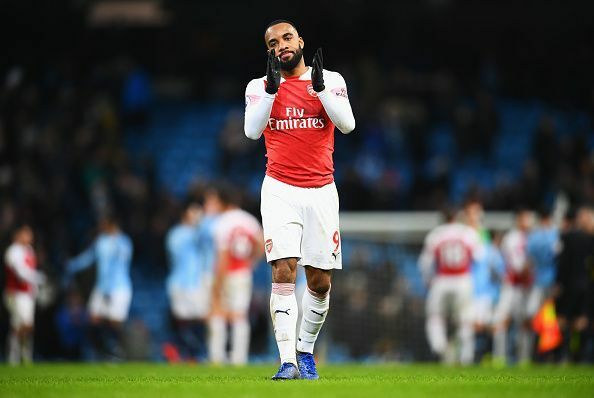 Though losing to City isn’t the biggest crime in the world, the worrying pattern of the Gunners failing to fire on away trips could yet come back to haunt them. And with another toothless attacking display, surely such performances can no longer qualify to be an anomaly.